Hunter also made special boots for various designers such as Jimmy Choo. Which do you like more, Hunter's original lizard print or Hunter for Jimmy Choo alligator print? 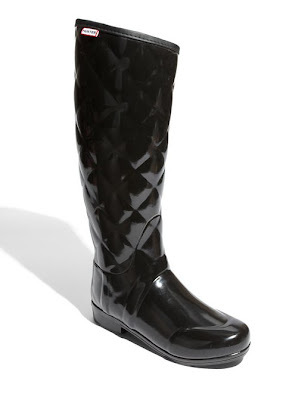 For me, I am partial to this pair of quilted Hunter boots because it reminds me of a Chanel quilted bag. With fur still flying high in the shoe trend, I would totally add a pair of faux fur topped socks to complete the fur look. Leopard print available as well. As much as I like to be trendy, I am not convinced a pair of fur boots like this is savvy for me, even if it is Chanel. What do you think, allover fur or fur detail only? I love all the boots you've shown in this post! And I prefer fur detail as opposed to all over fur (and looking like a woolly mammoth). I just wish my calves could fit into Hunters. I seriously have a hard time putting them on, and then they look scrunchy in the ankle. It's really annoying! Oh my, those are awesome! 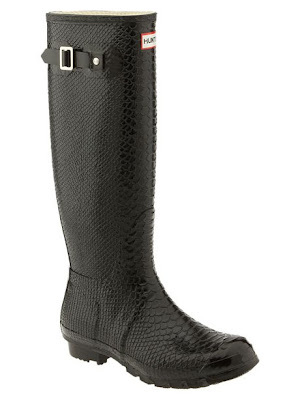 i need rain boot so bad!! so cute! Whenever it's a rainy I wish I had bought a pair of croco embossed rain boots. I saw a very similar pair to the hunter/choos by chrisitan siriano for payless! !, but I don't think it's on their website anymore. The fur boots just don't look appealing at all. I know it is or was trendy but gosh, can't imagine myself wearing those things. I like the first rain boot best. Fur boots just do not appeal to me at all but fur trim is very stylish. I like the quilted boots too. Nice and I totally thought Chanel when I saw the quilting too! Love all of those boots! 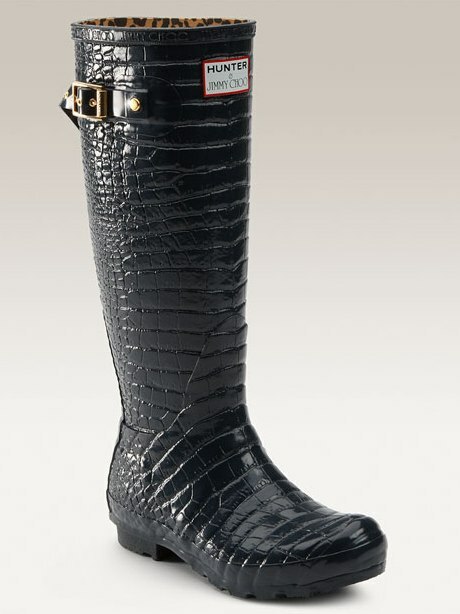 I've been wanting a pair of Hunter boots! They would just be perfect for the rain. And the faux fur trim socks would be perfect with them! I couldn't rock those Chanel boots either. A girl I went to high school with actually had boots like that. Everyone told her they looked like a polar bear! Haha! Loving the Hunter boots!! The first pair is just fab enough for me! I fall for the Jimmy Choo more glamourish of a version... what a surprise! Ooh, fur as detail only, thanks very much! I'm saving up for a new pair of red Hunters for the rain! I love Hunter boots. They always look really cool. I'm not a fan of the furry ones though.